Officials want Congress to require all services that enable communications — including encrypted e-mail transmitters — to be technically capable of complying if served with a wiretap order. The mandate would include being able to intercept and unscramble encrypted messages. Read the full article here. Hossein Derakhshan, aka Hoder, who’ve been in held in custody since November 2008 without trial, received his sentence today. On charges the of collaborating with enemy states, propagating against the Islamic Republic, propaganda in support of counter-revolutionary groups, “insulting what is holy” and creating immoral websites, Derakhshan received a total of 19-and-a-half years in jail – plus a five-year ban on political and journalistic activities. I had the opportunity to meet Derakhshan, during a conference here in Stockholm in February of 2006 – and for a brief coffee, the day after, at the Stockholm train station. I was about to go to Iran to write my masters thesis, and he took the time to answer some of my questions. He was a man on a mission – that much was clear. There was something death defying in how he went about his business; he charged like an express train towards one of the most ruthless regimes on the planet, seemingly without fear. I was grateful, though. He bestowed me with some of his courage, and I went to Iran with less on my shoulders. Derakhshan has been credited with creating the Iranian blogosphere, which was extremely vibrant in the mid-00’s – some years before other countries caught up. And although his claim-to-fame as the blog father might well be exaggerated, it is clear that he did play a vital role, not only within the country but also internationally. He put Iran, unlikely as it was, in the middle of the blog hype. A country best known for oppression was suddenly on the leading edge. In the years between I met him and his arrest, he made both friends and enemies. And as his activities, ideas and ideology shifted throughout the years, some of his friends also became enemies. Sadly, it would become very obvious that very few of his enemies became his friends. Regardless, the new situation means we need to put aside such differences and back him up. Hoder do not belong in jail. Neither do any of the other Iranian political prisoners. So what can you do to help him? This will probably evolve as time goes by, but right now it seems like Facebook might be the first step in a campaign that will most definitely deepen as time pass. There’s a group created in his support, and joining will hopefully keep you updated on any new events. Best point of contact right now, and a sure source for regular and accurate updates is Cyrus Farivar, an American-Iranian journalist and author, that keeps in close contact with Derakhshan’s family. 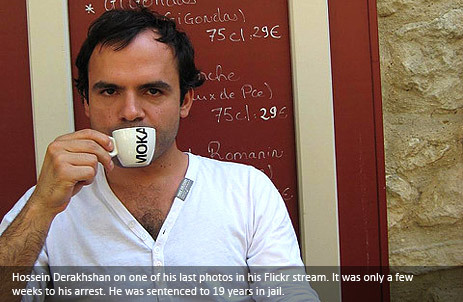 RSF reports on the sentencing of Hossein Derakhshan. “Such a long jail term has never before been imposed on a blogger in Iran and is indicative of a desire to make an example out of Derakhshan,” Reporters Without Borders said. Read the full article here. "Google has lately found itself on the receiving end of criticism from privacy and transparency advocates. But with two new tools, Google is trying to convince them that the company is on their side.” Read the full article here. You are currently browsing the Viewsdesk weblog archives for September, 2010.